The Texas Instruments MSP430 Family of ultralow power Microcontrollers consist of several devices featuring different sets of peripherals targeted for various applications. The architecture, combined with five low power modes is optimized to achieve extended battery life in portable measurement applications. The device features a powerful 16-bit RISC CPU, 16-bit Registers and constant generators that attribute to maximum code efficiency. The digitally controlled Oscillator (DCO) allows wake-up form low-power modes to active mode in less than 6s. The MSP430FG43x series are Microcontroller configurations with two 16-bit Timers a high performance 12-bit A/D converter dual 12-bit D/A Converter three configurable Operational Amplifiers one universal synchronous/asynchronous Communication Interface (USART), DMA, 48 I/O pins, and a liquid crystal Display (LCD) driver. Typical applications for this device include Analog and digital Sensor systems, digital Motor Control remote controls, thermostats, digital Timers hand-held meters, etc. 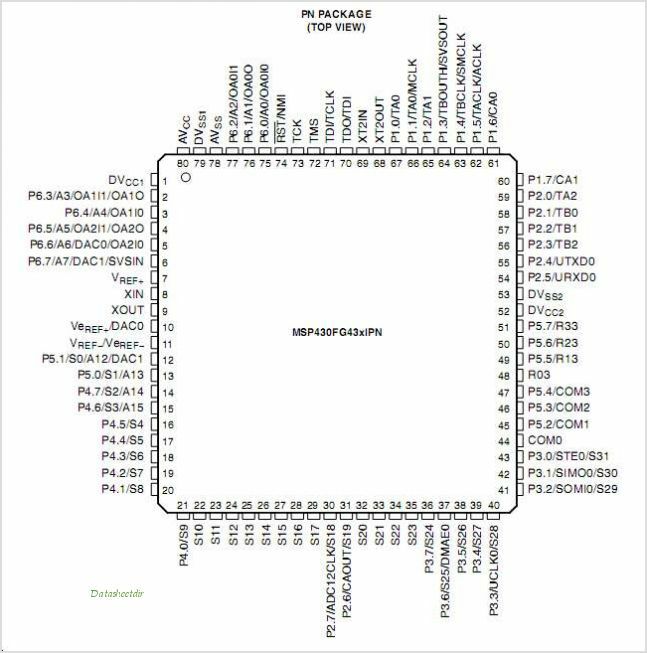 This is one package pinout of MSP430FG438,If you need more pinouts please download MSP430FG438's pdf datasheet. MSP430FG438 circuits will be updated soon..., now you can download the pdf datasheet to check the circuits!